4:45 pm: At 17th and Folsom, an arrest was reportedly made when a female struck a victim on his motorcycle. 8:25 pm: A strong arm robbery occurred in Ingleside when a suspect reportedly became confrontational and grabbed a victim’s property before fleeing. Arrests were not made. 10:34 pm: A suspect reportedly approached a victim in the Mission with a glass bottle. The suspect bit the victim on the neck, and a fight ensued. 3:04 am: In the Tenderloin, an aggravated assault reportedly occurred. No further details at this time. 7:00am: A victim was reportedly awoken by glass breaking and found suspect in her room. The suspect grabbed her laptop, and struck her on top of her head with it. 9:15 pm: Victim in Ingleside reportedly heard thumping noise, and found her garage door to the living area damaged. No suspect seen, no arrests made. 11:00 pm: At Mission and Cortland, a suspect reportedly struck his victim with a baseball bat. When the victim regained consciousness, he found the second suspect standing over him with a knife while going through his pockets. 12:35 am: A commercial robbery in SoMa occurred, with 3 suspects reportedly demanding the victim’s property then taking cash out of the till. 2:25 am: A suspect approached 2 men while walking down the street, and stabbed one in the back. After being stabbed, the victim and his friend run down the street and see a person who they think did the stabbing. They assault the person, and flee the scene. The person who was stabbed was never found and injury is unknown. 11:00 am: In the Mission, a victim reportedly gets off at Light Rail stop due to mechanical problem. As he disembarks, the victim is approached and is robbed with a gun. 3:30 pm: At 14th and Irving, a victim reportedly posted an ad on craigslist to sell his iPhone 4g. When he meets with the buyer, the suspect asks to see the phone and tries to grab it. A fight ensues, and the suspect grabs the phone and runs to a waiting car. 9:00 pm: At Geary Blvd. and Mason St. a suspect reportedly fired across the street, fatally wounding 1 victim and hitting 2 others. All suspects fled, 2 of the 3 victims released from hospital. 1:20 am: Victim was reportedly getting into his parked vehicle at 18th/Castro, when two suspects approached, one brandishing a handgun. Suspects forced victim into his vehicle, and demanded he drive them to Oakland. In Oakland, suspects order victim to pull over and to get into trunk of the vehicle. Victim refuses. Suspects force victim to empty his pockets, and begin walking away down the road. Victim walks to nearby gas station and calls Oakland P.D. 1:56 am: In SoMa 2 victims were reportedly walking down street with a bunch of friends. Victims then heard shots fired, 1 victim struck in upper arm, the other suffered a gunshot wound to left ankle. Both treated for non-life threatening injuries. 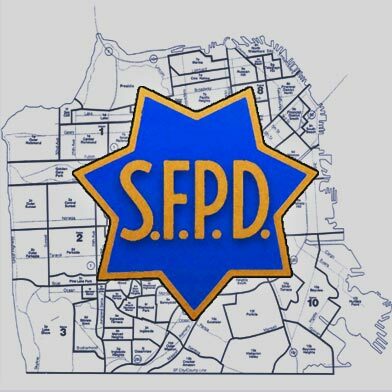 2:41 am: Victim was approached by suspects in Tenderloin. One suspect brandished a knife and stabs victim in the right forearm and robbed the victim.